You know that friend you have that obnoxiously thinks that he or she knows everything there is to know about cars? (Among my friends that would probably be, uh, me.) Call them right now and bet them a burger and a beer that they can't tell you what the fastest 4 door sedan sold in North America in 1991 was. There's a very good chance you'll be eating and drinking for free tonight. 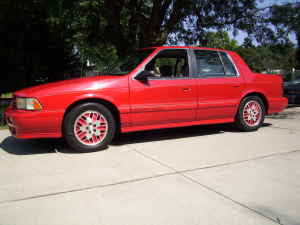 Yep, the Dodge Spirit R/T was the fastest 4 door sedan sold in North America in 1991. Who knew? According to Car & Driver, this car reaches 60 MPH in 5.8 seconds. To put that in perspective, a US spec 1991 BMW M5 took 6.4 seconds to hit 60. Chrysler created this car by taking their venerable, 93 HP, 2.2 liter 4 cylinder engine and slapping a Shelby / Lotus designed, Lotus built, DOHC head on it. They then threw on an intercooled turbo that ran at 11 pounds of boost. 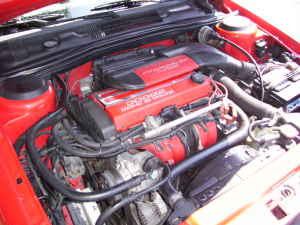 The result was a 224 HP 2.2 liter engine. (If you want to go old school, it was a 135ci engine. That means that it put out roughly 1.67 HP for every cubic inch!) Apparently they didn't want anyone to notice this incredible engine, so they dropped it in one of the blandest car bodies ever built; the Dodge Spirit. The result was the ultimate sleeper. Chrysler did some modifications to the suspension including increased spring rates and front valving, performance-oriented rear shocks and a 28.6 mm rear sway bar. The standard tires were 205/60R15 Michelins and the wheels measured 15" x 6". Still, ride / handling was not the R/T's high point. Car & Driver said that the stiff springs and shocks caused the R/T to be "nervous, unsettled and even clumsy". Road & Track reported that "When cornering on bumpy pavement, limitations of the K-car-based chassis become evident". There is very little externally to distinguish the Spirit R/T from the standard Spirit. R/Ts came in only two colors; red and white. Except for some chrome around the windows, everything was painted red or white. The R/T also got front foglights and a little spoiler on the trunk. That and the badging were the only things that were different from the standard Spirit. Very few of these cars were built, just 1208 in 1991 and 191 in 1992. This car is rough, but drivable and very restorable. The seller says it needs paint and a bit of body work (including some rust repair). 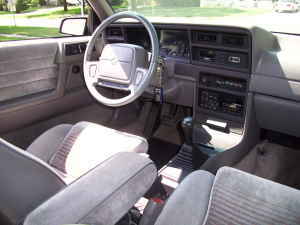 But, he's done a lot of work to it and the asking price is a very reasonable $2350.00 or best offer. I love sleepers, but this may be even too much of a sleeper for me. However, if you want a high performance car that is completely invisible and virtually unknown, this car can't be beat. Located in Omaha, NE, click here to see the Crigslist ad. A very big thanks to JaCG reader, Christian, for sending me the link to this car! Wow... I was completely clueless about yesterday's Alfa. I never knew such a car existed. I could say the same for today's Spirit entry. If I was looking through listings, I would have skipped by this Dodge. At this rate, if I continue reading Car Geek for the next couple of years, can you send me a diploma? Can it go around corners like the BMW? Can it stop? Can it drive for more than a few miles without falling apart? Finally, can the driver of this car fight the suicidal thoughts he feels every time he touches the cheap plastic interior? No on all counts. Jon - You're now JaCG / Phd. Anon - If asked, I think most people would have guessed that the M5 was the fastest sedan sold in North America in 1991. I used the M5 simply as a point of reference. As I've written in the past, I've owned my E36 for 13 years. I've personally put close to 200K miles on it (out of a total 218K). It has given me no trouble and is still a pleasure to drive today. You'll get no argument from me about BMW quality. Anonymous, I get what you're saying about a BMW car from '91 or '92 being a better vehicle overall, but that's why the Spirit is being called a "sleeper" here. Of course everyone would prefer a typical Beemer to a usually crappy Dodge Spirit from the same year for the reasons of quality and handling that you mentioned already, but the main point of bringing it up was to educate all of us on this interesting bit of trivia (I sure as heck didn't know about an SRT-esque Dodge from almost 20 years ago and I'm sure not too many people remember that factoid today) and to spotlight a rare car today. 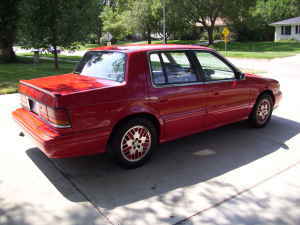 So, I say that there should be no griping about this car being listed, as I'm sure all of us realize its limitations with it being an early 90's Dodge, but in the hands of quirky people like ourselves I'm sure that someone will get it and they will love it. Technically 3 colors were available on the Spirit R/T; In '92 Silver joined the line up but very few were made; 31 actually. I have to say I get a little miffed when people bag on 1980's Chryslers. I've owned many...never had a single issue with any of them. The don;t break down, they don't fall apart, and they have non-interference motors , which means even if you blow the timing belt/chain your engine is fine. IN fact i owned a 1986 Omni GLH Turbo which i built with factory Chrysler parts into an intercooled 750hp (at the wheels) all-wheel drive monster. I drove a completely stock Spirit R/t a friend of mine owns and it handles just fine. Idk what the original road testers were driving. As far as I am concerned the 1980's turbo dodge/chrysler cars were superior to anything else offered in the world in all aspects, on top of being easily and cheaply modified with factory parts that wouldn't void your warranty.